This modern Hall has excellent facilities. The main Hall has a dance floor, so please note, stiletto heels are not permitted. Travelling from the East, come along the A27 and take the Havant turn-off. At the roundabout, turning right to head north. Pass through Havant and over the railway bridge to arrive at another roundabout. Here turn left, and drive half a mile till you see Bedhampton Station on your left. Take the next left turn and park in the Hall car-park. Travelling from the West, come along the A27 and where it branches into the A3M, bear left and come off at the slip road. Here, go round the roundabout to turn right up Bedhampton Hill. At the next mini-roundabout, go straight on - it's a slight kink to the right - and take the right hand lane (straight on only) at the traffic lights. After 400 yards, you will see pedestrian lights. Take the next right after this and park in the Hall car-park. Travelling from the North, come down the A3M, and take the slip road at Junction 5. At the bottom, turn left up Bedhampton Hill. At the next mini-roundabout, go straight on - it's a slight kink to the right - and take the right hand lane (straight on only) at the traffic lights. After 400 yards, you will see pedestrian lights. Take the next right after this and park in the Hall car-park. 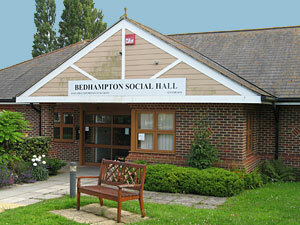 The nearest station is Bedhampton, which is 200 yards away. Click for a street map that you can print. The building has level access. There are modern, fully-equipped disabled toilets.